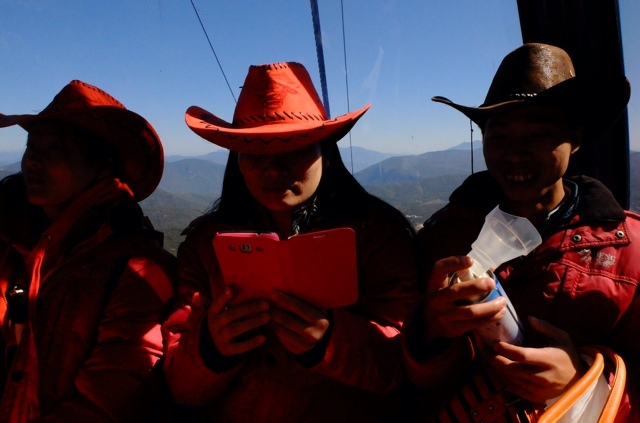 Worlds highest | high road to..
Up , up and away : grand day out starting from Lijiang in Yunnan at 2400 meters , taking the cable car to 4506 meters , topped by stair excercises up to 4680. This is the highest running cable car in the world at the moment : the Meridian cable car reached 4700+ meters , but stopped operating in 2008. 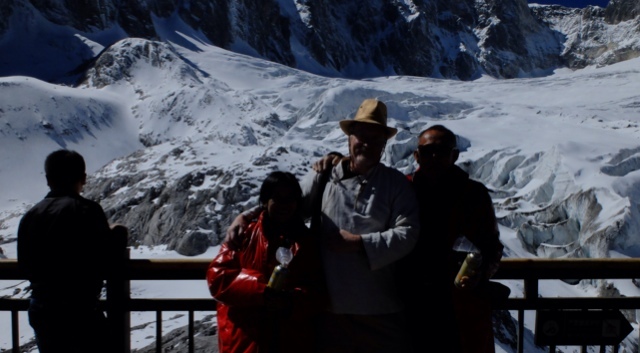 Second highest would be the Lina Rioja down to La Paz from El Alto @ 4061 meters. * the Gulmarg gondola makes two different claims on their official homepage : 3747 meters ( around thirty meters lower than the the Aiguille du Midi in Chamonix ) and 3979 meters . The later is clearly an exaggeration , Google Earth places it a few meters below the Quito Teleferiqo. 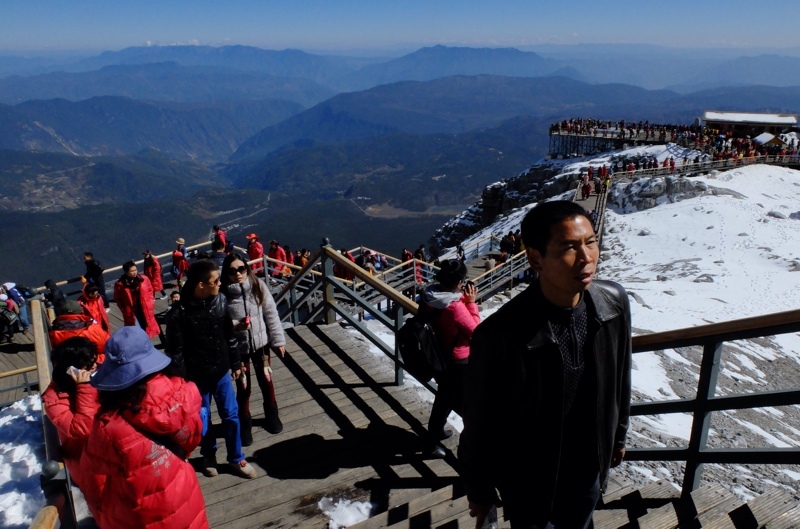 A second level of exaggeration is often found on Indian websites , giving not the altitude of the cable car station but the top of the mountain , starting from 4200 meters. * Yunnan holds another cabe car going from Kangding at 2600 meters , reaching .. have to check that with a GPS next time around. Worlds highest …. Those two words contains a lot of power , and status . Just below our logical level rests the concept that we should look up to … whatever is higher in the field of vision. Early 19th blablaology held a lot of the same blanket admiration for Andean mythos as is accorded today to Tibetan culture , fuelled by that unworded theme : those literally closest to heaven should be infused by … higher values. The concept is in no way restricted to Western culture , the Americans that made a emergency landing in Lhasa in 1942 found themselves dealing with hostile reactions because they had placed themselves above the Dalai Lama in the Potala. India has a number of claims on worlds highest , that complicates my love of India : worlds highest road (Khardung La , not ) highest cable car (Gulmarg , not) . One thing mostly forgotten though is the high politics of India. Mridula posted two years back a photo of probably Indias highest post office in Kibber, my reaction to that was that it might be at the same time one of the worlds highest polling stations : post offices and schools over the world is also where elections take place. In Ladakh and Spiti a third communal setting is used : the Buddhist monasteries. Ladakh has recently completed elections in this setting. It holds not only some of the highest elections in the world , but also the smallest constituencies in the world : India defines democracy as the opportunity to participate within a days walk , which means that grumbling Indian civil servants are sent out to open polling stations above 4000 meters … in some cases to serve less than a dozen voters. Some of the grumbling comes from sharing their sleeping bag with their laptops : it was a long time ago that India got rid of the rituals of boxes , slips of paper etc that is taken for granted in less developed parts of the world .. like where I live. Elections are 100% electronic , even when it involves twenty degrees below in Ladakh , or transporting out the paraphernalia with elephants and working by candlelight in Assam. My candidate for the worlds highest election : the polling station in Thugsey . It´s probably not 5000 as claimed , but it does ovelook the salt lake Tso Kar : definitely higher than 4553. Democracy , it has to be a higher value. 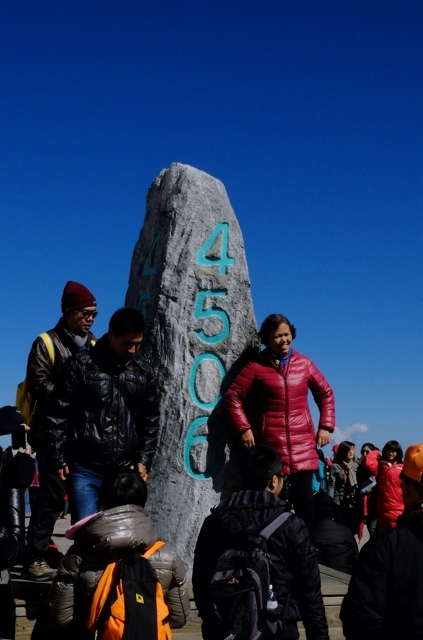 Other contenders : Anlay Phu , probably referring to what is mostly called today Hanle : should be around 4300 according to Google Earth , the observatory overlooking the plain is at 4500. Grumblings aside, the image of the six persons finding a way to work out the elections in Thugsey is the sort of thing one wants to read about , post-Mumbai : a Kashmiri (i.e. among other things , Muslim ) policeman with a Ladakhi colleague , a Sikh teacher working in Leh , and three more Ladakhis finding common grounds : “We only cooked food that all of us could eat,” Mr. Mir recalls, “and shared everything we had, from blankets to extra woollens. It was an educative experience; everyone in our State should be made to go through it!” in the words of Abdul Hamid Mir , a soil expert from Srinagar. When I show the picture from The Hindu and talk of the work put in I get some reactions on the the theme “they would be better off with a ..” . Apparently the people involved feel differently : elections is seen as a way of changing their life , starting with the waterpump that saves hours of work every day. Thanks to Mridula for suggesting the theme in the first place , and Abram Pointet for input on Anlay and more.